Buyers retain all rights arising from EV legislation, in addition, Electronics OÜ offers a warranty for all products, period is indicated in the product’s “Warranty” section. During the period of warranty, we will repair the defect of the device (except the defect referred to in the product’s “Condition” section at the time of sale) or replace the device with an equivalent device. A new warranty with the same duration as the original warranty will be granted to the replacement device. Software errors are not covered by the warranty. 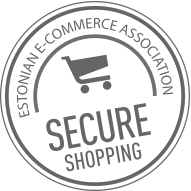 If there is a shortage of the used IT device during the period of warranty, which, in your opinion, remains within the responsibility of Electronics OÜ, please bring the device to our store at Sõpruse pst.25, Tallinn. Electronics OÜ is not responsible for preservation of information stored on the data storage media of the device – the data is not copied or stored, so please save all information that is important to you on some other medium. preventing the device from being misused and physically damaged (including crushing and falling as well as injuries caused by the presence of different objects, liquids, and excess dust, etc.). ensuring that the equipment is protected against the harmful effects of external factors (for example, voltage fluctuations, humidity, thunder, etc.). the original purchase documents are missing or these documents have been tampered with.